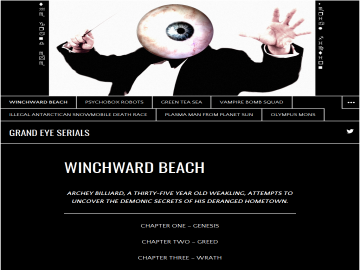 "Demonic nonsense in a sea-side town"
Archey Billiard is an impossibly pathetic thirty-five year old man working in a run-down amusement park under the guidance of his terrifying, OSHA-defying boss, Mr Legion. Without warning, Archey one day finds himself thrown into a bizarre series of events all revolving around the demonic secrets of both himself and the mysterious town of Winchward Beach. Winchward Beach has not been tagged yet. Help others find Winchward Beach by tagging it! Winchward Beach has not been reviewed yet. Winchward Beach has not been recommended yet.